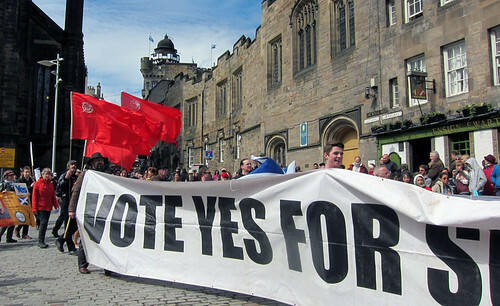 George Mackin considers the approach the left should take to the 2014 referendum on Scottish independence. 1. 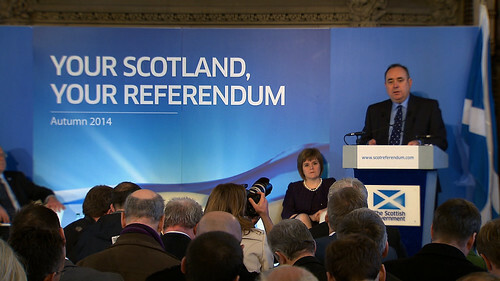 The SNP as far as electoral politics goes, are at the moment the only show in town. I have never tasted puppy dog’s tails but ah ken what Jo is on about. What does SNP ice cream taste like? I think a little like the poisonous chocolate mousse offered to Rosemary in Rosemary’s baby. It’s creamy and yummy, but with a chalky under-taste to it. Delicious yet soporific. Like all ‘isms’, Nationalism even the civic nationalism of the SNP has its potential threats. Nationalism as a state of yearning leads to the romantic pulling of heartstrings and can be intolerant of competing identities, the recent draconian football bigotry legislation being a case in point. Sing any song you like, display any symbol you like as long as it is Scottish. The SNP have learned from the New Labour experiment. They are a benchmark of political triangulation, just as New Labour were in their heyday. To borrow an old American saying they know how to politically work ‘both sides of the street’. There is a flip side to this largesse. For every spending commitment, there is an opportunity cost of lost social spending. The significant cuts in Further Education Sector, the drastic cuts and privatisation of local government services and subsequent job losses are all hidden from view. To even speak of them is to be slapped down as being a unionist as was my experience when discussing the fiasco that is the SNP/Liberal administration in Edinburgh. The SNP may be politically defter, than the train crash that is the Scottish Labour Party but in reality they are two sides of the same coin. 2. You can’t chuck stones or half bricks 400 miles. One argument for independence that is not mentioned often but for me is a key one comes from the arch-unionist Walter Scott: Ye cannae chuck stones 400 miles, or half bricks. Let no one fool you, Scottish bosses are no less malign than English ones but with independence they are closer to hand. 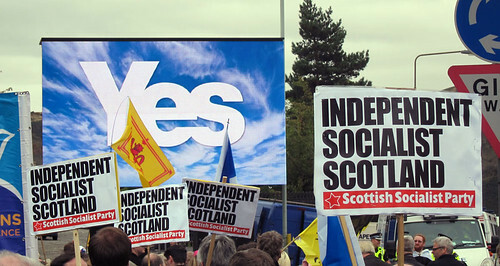 “Once we have independence then we can go for socialism”, I have been told by an ex-SSP comrade now in the SNP; as if changing history was as easy as forgetting a shopping item and then going back to the shop because you forgot the frozen peas. Puuurrleease. Gonnae no say that. The rightist Winnie Ewing famously said “stop the world, Scotland wants to get on”, to great applause year after year after year after year. In fact I think she gave the same speech at the SNP conference for nigh on a couple of decades to the enchanted faithful. Yet how can you stop the world as the world heats up and people starve and are in poverty in order to keep capitalism growing at the compound rate of 3%? 4. We wish to see an end of the British State as much as we wish to see Scottish Independence. In many ways the Scottish National Party is a very British party – think of the ‘Save our Regiments‘ campaign, or its active and open support to retain the Queen and its deeply reticent attitude about speaking up about Ireland. For fear of giving offence they have one leg in the British and one leg out. The much trumped Devo-Max as second favourite option, is in many ways reminiscent of Gladstone’s ‘Home Rule All Round’ slogan. In Scotland, the SNP (who I voted for in the first ballot, this year) are keen to spin the line that the Queen is a harmless old lady. And we should keep the monarchy and only talk about Ireland. If we mention the ‘Celtic Tiger’ and since the banking collapse, we are not to discuss our sister country at all – like that mad wife in the Charlotte Bronte novel that is kept up in the attic and never discussed. Now all the talk is back to us being Norway like in the Seventies! A confident wee nation at ease with ourselves, with no real divides between the haves and the have not’s. Yet still deeply disciplined in self-censorship. The Say Nothing Party. 5. You can’t insult your way to socialism. Calling the SNP a ‘Tartan Tory’ party is inaccurate. The SNP like the Labour Party is a mass party with many talented people and decent people and like all large political parties blessed with the usual group of malcontents, miscreants, oddballs, arse-lickers and careerists. If you live in Scotland or have ever been witness to an election count, you will notice an almost Life of Brian hatred between the two main political parties. There is a visceral hatred which is certainly not healthy or conducive to political discourse. The narcissism of small differences. 6. Political parties are only the echo of the battle not the battle itself. Every week or so our hard-working SNP councillor pops through the door a new, well produced and well funded leaflet full of tired nationalist politicians and lots of saltires, so many saltires. Scotland this, Scotland that. Freedom and Scotland and yet more freedom and those nasty other parties that are denying Scotland’s destiny and not speaking for ‘us’ unlike Scotland’s party which truly speaks and stands up for Scotland. Fade and repeat. Same leaflet, week after week, slightly different format and pictures. The same text. More police, less council tax and yet more good governance. The couthy, canny and canty party. Good for business, good for the people of Scotland. The sensible party. And the sensible party never use the C word – class. People who vote for the SNP = aspirational and people who do not and especially people who are not in the SNP fold are beyond the pale. Not truly Scottish or even better, the catch all phrase a ‘unionist’. 7. Beware of the building up of the dichotomous sophistry of bourgeois nationalism. The war is with the outdated fetters of capitalism not with England and Paul. It seems that the whole of Scotland is to be parcelled out in Calvinist fashion into those who support independence or those who are in favour of the union. I have always hated and resented the building up of the dichotomous sophistry and this ‘with us or agin us’ political tactic annoys the crap out of me. Also Scotland is not Ireland so cut this nonsense out especially if you are a pro-monarchist, British Army and pro-multinational big business party. 8. Political parties that court favour with powerful elites when achieving power almost certainly will not stand up to power when in power. New Labour are a case in point. Obama in power, the same. How many examples would you like? They were never on the left. Can you think of an example where a political party has been more radical than its stated objectives whilst out of power? I can think of a few, Thatcher and the like, all from the Right. The SNP may be recruiting members by their thousands at the moment but more and more of them will be careerists rather thanidealists. Ever was it thus. As Aneurin Bevan was oft to remark Socialism “is a religion of priorities“. 9. Scotland being independent opens up opportunities for the left. At the heart of this debate is what do we understand by the term internationalism? Are we seeking to build a truly democratic society from below – a politics that is based on decentralisation, diversity and cooperation? Do we, like HG Wells, envisage replacing capitalist globalisation with a world government? Do we believe like the Morning Star that the left should be in favour of larger broader states and any break from this would be a regressive step since it would divide working class forces? Moreover, socialists in Canada and Mexico – and the rest of Latin America too, for that matter – should be advocating union with the United States of America on the grounds that such a continental state would unite hundreds of millions of working people from the Amazonian jungle to the Arctic Circle. After all, a manual worker in Toronto or Guadalajara has more in common with a worker in a Detroit car factory than with a Canadian banker or a Mexican landowner. Also to take this particular tact is to understand the key forces which created the United Kingdom. The British state was created to unite the ruling classes of the respective nation states and you only need to take a look at Ireland to realise that this particular historical project played in disuniting the working class of the constituent nation states. 10. The Radical Left should support independence in a non-sectarian and positive manner. No one likes a smart arse and no one has the monopoly of truth. The left needs to organise a separate campaign outlining a radical vision of what an independent Scotland may look like, if we are willing to fight for it. That is not to say that we do not help out in the main campaign and engage with the widest possible pro-yes constituency- to quote Jimmy Maxton if you cannot ride two circus horses at the same time, then you shouldn’t be in the circus. 11. There is no such thing as a completely free nation. We are all Jock Tamson’s Bairns. We all share a common humanity. 12. The key reason for the rise of nationalism in Scotland is a political revulsion against neo-liberalism. By the end of Second World War people from the British Isles fought together successfully to defeat Fascism. 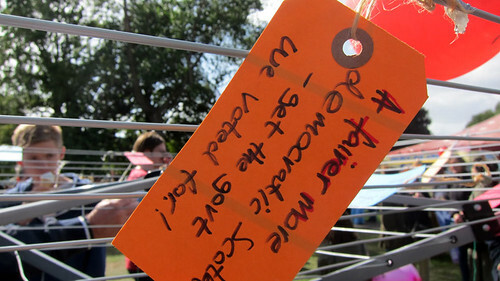 This brought a great sense of purpose and solidarity. The election of the Labour Party saw the delivery of the welfare state and the national health service – those two key reforms played a big part in putting a human face on the British State. The Scottish National Party after eighty or so years of immense hard work and self sacrifice were the main recipients of votes from an ever growing, angry, disenchanted Scottish electorate. Yet I would not write off all ordinary members of the Labour Party, especially the trade unionists. As for the leadership and Jim Murphy I am mindful of my granny’s quip, God rest – “ah ma wee torn-hole, the things ye see when you huvane goat a gun“. 13. The Scottish radical left has a proud tradition of supporting the break up of the British State. Marx is central to our understanding of this historical epoch. Let’s not throw the baby out with the bathwater. The mainstream middle class nationalist parties have only been around in the last 80 years or so the radical left in Scotland has a proud tradition for calling for a Scottish Republic, stretching at least back to Thomas Muir and Robert Burns in the late eighteenth century. Scotland has also a proud Marxist tradition. James Connolly and John MacLean in particular and both from poor backgrounds, which is unusual – most of the main socialist theorists have been primarily bourgeois in origin. Those particular thinkers have plenty to say about the current situation we are under; in particular the nature of the British State and how nationalism relates to internationalism. Both were adamant in stressing that affluent elites should not define what constitutes nationhood and freedom. I know the left in Scotland is in a mess and is deeply fragmented but Marxist ideas are still I believe pertinent for the here and now. Let’s not keep our mouths shut and rely on the well read, the well wed and well fed define for us our freedom for fear that we wake up to meet the new boss who is the same as old boss. This is a time for ‘Imagine’ but it is also, as many Irish people on the left would no doubt warn you, a time not to be fooled again. (I find it deeply regretful that a lot of younger people, some even within the SSP do not have a deeper understanding of Marx and his deep humanism). At the risk of sounding like a posh third year drama student – what is needed is a counter hegemonic project worldwide, not daft guys wi’ tartan trews singing Killiecrankie- although let it be noted for the record I’m not averse to a wee sing song, from time to time. Whether Capitalism will resolve the problems and the injustices that the world faces remains to be seen. I don’t think it will fall through its own contradictions; it will need to be pushed. Marx who famously decried that he was not a Marxist was asked by his beloved daughters in a family game what was his favourite maxim? He replied ‘nothing is alien to me’ and as for his favourite motto he replied ‘everything should be doubted’. Translated from Latin, naturally. We are fundamentally humanists caught up in the nexus of this world for such a very brief and wonderful time. Let us reject all smelly orthodoxies and all forms of primate dominance. We will be long gone of course. We are close to the dead and soon will be food for the worms. Yet what we do matters on this earth and we need to look at ourselves in the mirror and judge how we lived and what we did with our lives. Fundamentally socialism is matter of humanist ethics. 14. If Scottish people can run their own affairs. Scotland people can run their own industries. We are the country who decided in the Sixteenth Century we had the right to pick our own church ministers. Democracy and mitigated scepticism is a central plank of the Scottish Enlightenment thinking and indeed Scottish Working people’s culture. The democratic intellect runs deep within Scottish culture. Gregor Gall looks at what a socially just Scotland would look like and how that differs from the vision of the Scottish National Party. The now unfolding public debate on independence in the run up to the referendum in late 2014 provides for a once-in-a-lifetime opportunity to put the case for a socially just Scotland. So long as the debate is not parked in the cul-de-sac of constitutional politics and constitutional wrangles, it should be relatively easy to ask the mainstream political parties and opinion-formers just what is their vision for a socially just Scotland is. And, if they come up short, then use the occasion to put forward a radical vision of what is needed to achieve a socially just Scotland. This is because there is no point having the debate, the referendum or voting for independence (or ‘devo-max’ if it makes it on to the ballot paper) unless we can imagine a better, more socially justice and equal society in Scotland. So a lot is up for grabs. The SNP in particular has a blind spot in any search for a socially just, independent Scotland because while it has some reflexes to the left on social issues, it is positively neo-liberal in its economic policies. And economics easily trumps social issues in the capitalist mainstream. So for Salmond to have recently pronounced that Scotland after independence – under the SNP – could become a ‘progressive beacon’ for other countries is, frankly, way off the mark. This is because the centre piece of the SNP politics is not so much an independent state under capitalism – which it is – but that through state-sponsored trickledown economics, the economy in Scotland can grow and everyone and their living standards will be levelled up in the process. The key policy in all this is to cut the rate of corporation tax to something like that of the Irish Republic. But we must recall the Republic became massively unequal despite the overall economic growth and such a pursuit of inward investment as part of a programme of economic deregulation created the conditions for the extended age of austerity that Irish citizens are now experiencing after the ‘boom’ turned to ‘bust’. In economic terms, Salmond and the SNP take the view that all new jobs are good jobs regardless of their terms and conditions. This could be seen by Salmond’s welcoming on two recent occasions of Amazon’s investment in Scotland. He did not even think to attach any conditions – like those of union recognition or a living wage – to the receipt of public funds that Amazon received for making these investments. Jobs that create spending power to the SNP are the source of economic and social betterment. But it does matter what kind of jobs are created and how they are remunerated. It also matters that they are secure jobs. Equally, it matters that low paid jobs should not be subsidised by a social wage because, in effect, this means the taxpayer is subsidising employers and letting them off from paying a level of wages that requires no social wage prop up. In other words, the notion of genuine and deep-seated social justice (never mind socialism) is absent from the SNP’s economic policy. Salmond wants to create economic growth and let others determine who benefits from it. In effect, this means the employers and existing power elites will make these decisions. That is probably why many employers are not fazed by independence and many are for it – especially if corporation tax is lowered. It then seems that the SNP’s ability to win the ‘yes’ vote in the referendum is – all other things being equal – very much weakened but its inability, if not unwillingness, to demonstrate how and why an independent Scotland could and would be better for the mass of citizens in Scotland. This is not to say that the SNP is not a socialist party – clearly, it is not – but that it is hardly even a social democratic party either. Social democracy is defined not just as the search for social justice within capitalism but the willingness and ability to do so through progressive reforms where state intervention ameliorates the processes and outcomes of the market. In other words, reforms. The vision on the left which supports independence should stress above all else the possibility of determining people’s own economic relations and, thus, social destiny. Whilst a republic should be part of this vision (especially as the SNP wants to maintain a constitutional monarchy), the key reason why citizens should vote at all and for independence will hinge upon whether they believe their living standards and those of their kids will be better in terms of jobs, health, education and so on. But this in itself is not enough because a vision of this better life could be a neo-liberal one of growth and expansion as per the SNP. The two extra ingredients that are needed are a) a more just and equal society and b) an environmentally sustainable one. The phrase ‘we are all Jock Tamson’s bairns’ still means a lot in Scotland and indicate that the political centre of gravity is to the left and essentially social democratic on many issues. In order to provide a representation and outlet for the values bound up with ‘Jock Tamson’s bairns’, the arguments for independence must comprise arguments for a redistribution of wealth – something that will scare many of the SNP’s business supporters. Equally well, we cannot allow the progressive vision of an independent Scotland to be one of economic growth at all costs – even assuming it was more fairly distributed – because of the environmental devastation that would create. None of this makes an argument for or against independence as such. The key issue is whether the situation of independence is an opportunity to advance a radical left agenda. And it seems, there is far more of a possibility to do so in the run up to and under independence than under the status quo (whether of ‘devo-max’ or not). I use the term ‘possibility’ rather than ‘probability’ because the weakness of the left cannot suddenly be magically solved under independence. However, with the focus of debate likely to be on ‘what kind of Scotland do we want?’ and with more latitude to determine this in Scotland itself than ever before, the argument for independence seems substantially stronger than the argument against.